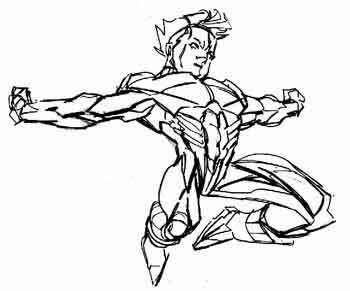 Ever wonder how some artists can draw cool looking action shots like this without any seeming effort??!! Well, read on my friend! 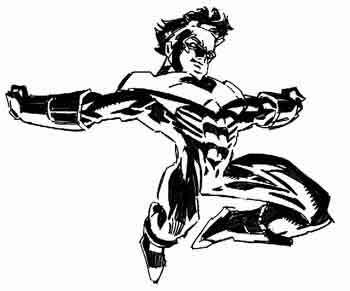 I'm going to quickly walk you through a process that I use everyday in the course of drawing Nightwing in unique action poses! This is how it all starts! Well, this is how it can, and often does start! Sometimes, as I try to focus my mind's eye on a mental image of a figure in action, the actual detail is nebulous at best! Sometimes, all I can get onto paper quickly is a very rough gesture drawing. 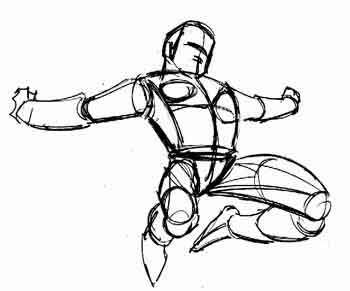 A gesture drawing is a very simple drawing that captures the gesture, or body language, of a figure with minimal detail! Easy! 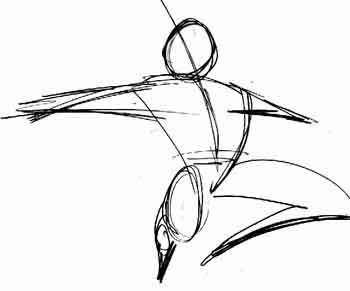 A gesture drawing can take as little as a few seconds to record! We're not making a masterpiece - we're quickly transferring an impression to paper! If the gesture isn't right - throw it out and do another! In fact, you can do quite a few gesture drawings in a very short while, and as you do them I'm sure you will find yourself approaching more and more closely the image in your mind. For this step, get yourself another sheet of paper and simply lay it on top of the gesture drawing. This gives you a clean surface to draw on - no clean-up required - and if you don't like the cylinder body, you can just move over to a clean area and start over!! Sometimes, this is the step where I begin my figure work. If I am warmed up, and drawing in the zone, I can get a better grip on my mental pictures and get to this cylinder body stage pretty quickly. Here too, these drawings can be rendered very quickly - say less than 20 seconds. If the position of the body is not right, do another! Keep going until you get one that is in the position/angle you want! But, no matter how we got here - we're here! Now that we have the basic form in the position we like, we can add some musculature! Here's where your detailed study of anatomy will pay off! Get yourself another sheet of paper and simply lay it on top of the cylinder body. Try your best to get the major muscle groups indicated in the correct areas, with the proper points of attachment on either end. Render the muscles simply but clearly and completely, as we will apply the lighting in the next step! If you don't like your musculature - no worries! Simply put a clean area over the cylinder body and try it again! Pay close attention to the direction of the forms. Do the arms point toward you or away from you? Do the legs point toward you or away from you? Is the chest tilted toward you or away from you? These details are important to see, because they determine which muscle will overlap others. 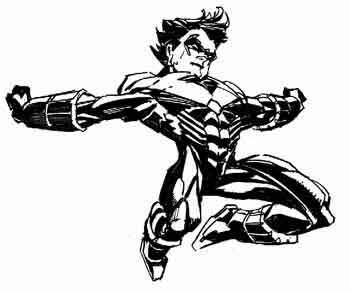 For example, consider Nightwing's left arm. It is receding away from us. Therefore, the deltoid will overlap the top portion of the bicep, and the bottom part of the bicep will overlap the top part of the forearm, and the bottom of the forearm at the cuff of the glove will overlap the hand. Note that since you've rendered your muscles clearly in detail in step 3, you are free to experiment with different light sources without having to do the drawing all over from scratch! For this drawing, I've gone back to the figure drawn in step 3 and I've applied a light-source from below. Just as before, I've simply determined the shading on each muscle if it is in a position to receive any light from below!